Every year, I serve as honorary goal-tender at a very interesting wholesale show, helping my sister gather orders for her soap company. Anyone who creates their own product knows how difficult it can be to tell people how wonderful their stuff is, while it is much easier to talk up things in which one is not so personally invested. In fact on occasion, Maryanne and I will switch sides of the table when we show side-by-side, with her hawking my magazine and books while I sing the praises of her soap or lampwork. A major local farm and garden supply company holds a combination wholesale show and customer appreciation expo, where many of their suppliers set up to talk face to face with the customers, allowing them to see new products and reps up-close, and place orders for the coming months. Farmers come from the entire Mid-Atlantic region, and the vast majority arrive by Amish taxi - vans with hired drivers (many of whom look eerily similar to Yosemite Sam) - giving the horses a day off. The air is filled with excitement as people who rarely get to see each other catch up and visit. New babies to show off, young people shyly flirting, and groups of men and women (mostly separate) shooting the breeze, all while an enormous amount of shopping goes on. There are 2 main meals served during the show, and they are smorgasbords featuring traditional PA Deutsch dishes that are reminiscent of our childhood, just as the whole scene reminds us of family reunions of long ago. We are quite certain that we are related to a number of the people we talk to each year. As with many of the most fortuitous events in life, we stumbled into this show several years ago, not even knowing beforehand that such a thing existed. We love it. Even in just the past few years, we've noticed an expansion of organic options, as well as heirloom seeds. The non-organic products are still there, but the focus is quickly turning. The company across the aisle from us had these great outdoor flames, sort of a miniature fire for the city dweller to use on a patio, or perhaps even a country deck. They were, unfortunately scented in citronella, jasmine, and (I think) vanilla. We suggested unscented and cedar as options we'd prefer, and the rep thought they were great ideas, although they were selling like hotcakes. Next to him were gazing globes made in Altoona. Some looked like giant soap bubbles, and of course we liked them the best. I loved the rainbarrels and outdoor sinks and pumps. A seller of water garden supplies had some spectacular plants. I snapped these pitcher plants just after the lights were turned on in the morning, so they aren't open yet. Outside in the lobby, a row of tables was set up to hold the hats and bonnets of attendees. It was a lot of fun, and each year we win a few more farm markets over to trying handmade soap. Between customers, we did some proofing and editing on the Nov/Dec issue of the magazine so that we can get it to the printer before the end of the month, and that should get finished up today. Maryanne's husband made another 8 molds while we were gone so that she is able to double daily production with not a lot of hassle. Off to the next great adventure! We've had a hot dry summer, and the things I'd typically forage at this time of the year show a lot of stress. One way to look at it might be that they've been through the same challenges we've been through, so if I want to use them medicinally, maybe they are just perfect. Usually we try to find robust, plump specimens, but just maybe these stubborn fighters will be as good or better. Most of the things I use medicinally over the winter were gathered weeks ago, but I'm going to do a little experimentation this year to check this theory on myself. If you don't hear from me.... heh heh. The calendula is going to seed. I picked the dry parts from the plant and threw them back into the garden where it would be nice if they came up next year (instead of all through the yard). The seedheads are often included when one purchases dried calendula as whole flowers. The first time you see the little seeds floating in oil, you'll think they are curvy little worms. Don't panic, they're just seeds. It is possible to purchase just the petals, but the resinous buds and flowers are most useful for salves and balms. We have several patches of various mints in the field beside my house. My brother-in-law gives them a wide berth because he knows I use them for tea blends. Sometime in early July I asked him to mow them so they'd start fresh. He must have thought I said DON'T mow them, so it was only a few weeks ago that they were mowed. They are finally to a point where I can gather the tender leaves that make up a little rosette. I like to pick that part so there isn't really any stem to deal with after they're dry. I gathered a small amount of passionflower to dry and send to a friend across the country. The tendrils of the passionflower plant fascinate me, and I always add lots of them to the mix, going on the Doctrine of Signatures - this batch is specifically for circular thinking that is keeping her awake at night, so the curly tendrils make sense. There were also a few nice figs begging to be lunch, so who am I to say no? On the way back up the hill, I stopped and thought how pretty the chicory and the goldenrod look together. Behind them is a spectacular sage plant, and above them a still-bearing elderberry. The sunshine on them was perfectly autumnal. The Sweet Annie is in just the right stage for wreath-making. It is also the stage that makes allergy sufferers miserable. Ah, but it smells sweet! It's still hot out. The leaves are trying to turn, but the dry weather is just not helping. They may just give up and fall off. Soon it will be time to dig some roots! Beauty Berries - couldn't be more aptly named. The color is so unusual and... beautiful! They can be made into jelly, too. It's been an odd week around here, and not your usual odd, either. First, it's been the week of, "uh-oh, check the fuses." The list (so far, don't want to get too cocky, here) is: one running toilet, one broken water heater, one slurring stereo system, two empty propane cannisters (in the middle of a picnic), and an engine light glowing amber. Oh and when I switched the heat on the other night to take the chill out of the house, nothing happened. There was a time that each and every one of these things would have thrown me into a tizzy. Having them all happen in one week might have sent me either to my bed or to packing my bags (and at one point there, I did speculate on both options), but instead, I'm thinking about how smoothly it is all going. My brother-in-law Bob took on the challenges of the toilet and water heater in good humor, replacing parts in both of them within a day or two. The stereo was old, and I just pulled out a portable cd player, slapped in some heavy blues, and went about my work in the kitchen - that always goes better with music. I expected the one propane cannister to be empty, but it was a shock to find the second one was also empty. Still can't figure that one out, but while the chatter and laughter on the deck continued, I moved the food to a giant skillet in the kitchen to finish. The engine light is something I've had checked before. It happens every time the car gets a new tank of gas - which is once every month or two. Eventually I'll wander down to the service place and they'll look at it, and reset it. Someday I'll just get it fixed, but it's hard to hand over the cash for something that isn't important. The guy is coming over this morning to check the furnace. It's only a couple of years old, so it's probably something like a spider web or a reset button. Either way, it hasn't gotten cold enough yet to be a major problem, so I'm grateful to have found it now, because everyone knows these things usually happen on weekends in the middle of a blizzard. The flip side of all this, is that the lid blew off my sister's wholesale soap business a couple or three weeks ago, and it's been a rare day without a couple of nice orders coming in. We've been making soap, cutting soap, trimming soap, wrapping soap, and delivering soap. In there somewhere, I was invited to work on a project that is truly beyond my wildest dreams, and so far that's been great fun. 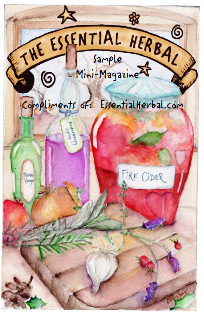 We're working on the Nov/Dec issue of The Essential Herbal, and it is coming along nicely (when, you might ask? oh... here and there), and By the Hearth is in the computer in great need of massage. The printer is going to love me! Subcriptions are up and show no sign of stopping, and sales of books, etc. (where you can also buy these soaps) have kept me hopping, too. We have two shows in the next week - the only ones we kept on the calendar this fall - and we'll be ready for them. And then it will be October - the busy season begins :-). They say that it's all about perspective. This month, I'm learning a lot about perspective. It looks good from here! It's been about a week of sneezing and coughing, so I got pretty fed up with the whole thing today. Time to pull out the big guns. Oddly, elderberry just didn't do the trick this time. I shudder to think how nasty this could have gotten without it, though. Today I made a syrup specifically for this thing that seems to fluctuate between my head and my chest. I got out some Osha, Licorice root, Elecampane, Wild Cherry bark, Ginger, and Lemon to start a decoction. A decoction is different than an infusion, because roots and barks need to simmer for a period of time, while infusions involve leaves and flowers that are steeped in boiled water for a few minutes. There is another, newer definition of infusions, but for our purposes, this will do. I filled a small pan with water, and put all ingredients except the lemon in to simmer for 45 minutes. I added the juice of a lemon for the last 5 minutes. After it was done, I strained it out. You can see here that my favorite method of straining things is with a steel mesh strainer lined with fabric from an old tshirt. As shirts wear out, they are washed and cut into squares for this purpose. They work beautifully. There was 2/3 of a cup of decoction, so I measured out 2/3 cup of sugar, and added a good dollop of honey. 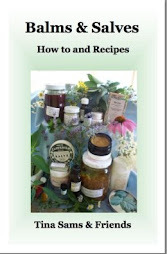 At that point, I also added 1/2 ounce of goldenrod tincture. It all went back into the pan, and was brought to a boil for a few minutes before being poured into bottles. The decoction alone could be drunk without being made into syrup, and I will make some more for after dinner tonight. It's nice to have it ready to go, though. 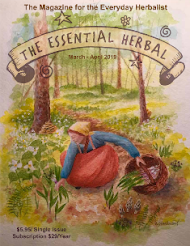 We're a week from the Nov/Dec publication deadline for The Essential Herbal, and of course the soap biz is crazy at this time of year, so coming down with a virus isn't good. 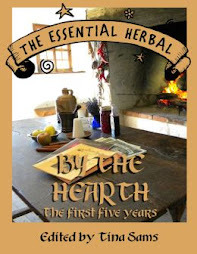 Last night I started feeling something going on in my throat, and took a good dose of elderberry with holy basil. This morning it was still there, so I repeated that. And I got serious about kicking this thing. All of these are either anti-viral or will help with the head-clog, and very beginning of respiratory issues. Then I started a big pot of ham and cabbage. This is something we ate all the time when I was a kid, and it is probably a standard PA Dutch dish. My grandmother and mother both loved cabbage, and passed that along to me. So far, the next generation does not share that love. First filling a big pot about 1/3 full of water, and then adding a large ham hock, I left that to simmer for about an hour until the meat came off the bone. To that, I added a nice chopped cabbage, a couple of onions, some turnips, and a few potatoes. That cooked for a couple more hours. I went into the garden and plucked a nice sprig of sage, and put that into a pint mason jar, along with a slice of crystallized ginger and a licorice root stick, boiled water, and filled the jar, pouring the water over the herbs. Here's my lunch: It was really good, and it will be good again for supper :-). 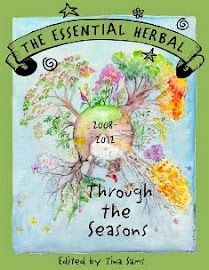 I will continue the sage tea and the tincture blend every hour or so. This thing just cannot get a grip on me right now! I was enjoying the cool breeze blowing over the deck, picking **&%^&*& elderberries again, when it dawned on me that I could sit out here and blog. The sun is about halfway down, and after the mid-90's of today, it is very comfortable. In fact, this may be the most perfect evening of the whole summer. The new deck furniture, purchased in mid-July when the prices went down, has hardly been used. Soon it will be put away for until next year. A week ago we were all along the beach and bay in Delaware looking for bayberries. It was 102 degrees. There were very few bayberries to be found, but it was probably because we weren't sure where to look - other than protected wildlife and or nature sanctuaries. We did find beach plums. This was the first time we'd ever seen them. Perhaps different plants taste different, but the ones we tried were very puckery - like they had a lot of tannic acid. They'd probably make wonderful jam, though. Earlier today I wandered around trying to find proof that summer isn't over yet. No such luck. It was starting to become clear when cornhusks started flying through the air like giant snowflakes the other day. Farmers are cutting the corn all around here. The view is changing. The sky is a different color, too. But that's not all. Walking past the garden, somebody was busy munching on what's left of the bean leaves. He looked at me in a sidelong manner, as if to say, "what are YOU lookin' at?" The dogwood berries are getting to be a deep red, which usually does not signal that there's a lot of summer time left :-(. I totally missed my favorite stage of the hibiscus seedpods, when they look like they are made of leather. They must have hit that on the day we went to the shore, because they are right by the door, and never had that sturdy, shiny look. Next up is the seedpod of Velvetleaf. I posted it earlier on the TEH facebook page as jimson weed, and Sue Hess discreetly clued me in. Back in the late 70's, there was a rash of jimson weed usage. I seem to remember someone trying to jump from the roof of the parking garage directly across from the police station.... ANyway... at the time I was out in a meadow with some kids, and someone pointed it out. Probably both plants were close together, and someone mentioned the barrel shaped pods. Hey, lots of things could be barrel-shaped-ish! So 30 or 40 years later, we got that one straightened out. The Sweet Annie is high as an elephant's eye and covered with the tiny balls that will soon make those with allergies miserable. It smells wonderful to me. The sea oats are drying in the sun, shimmering and quaking to the gentlest of breezes. It doesn't look like there was much proof of a lasting summer out there today. I will continue to look. Maybe down in the deep part of the woods, where the burning sun hasn't managed to cut through the trees and burn leaves. That's the real problem, you know. It isn't that summer is over, it's just that it's been so hot that the plants aren't handling it well. Poor things. That's what it is.